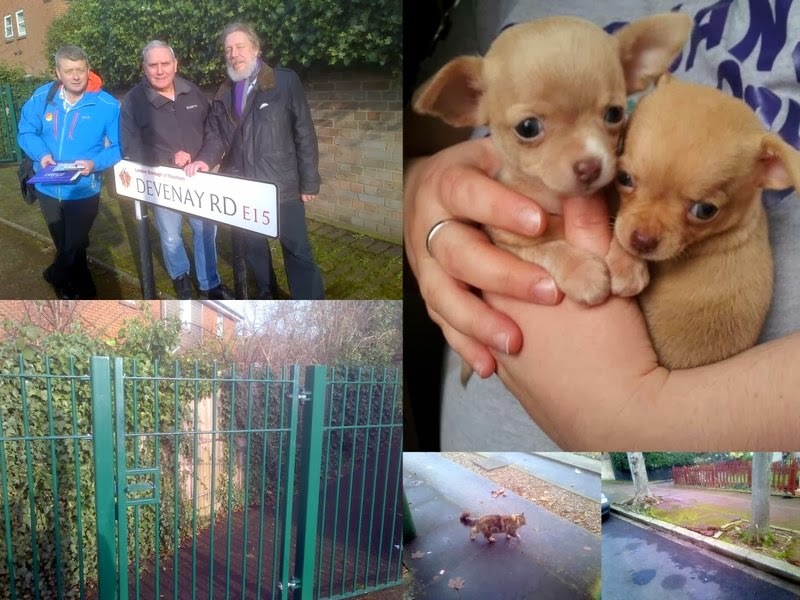 Picture collage from yesterday's door knock in my ward at Devenay Road, London, E15. Picture on top left is of me, top local community activist Bill and West Ham Labour candidate, John Whitworth. Devenay Road and the surrounding streets are very interesting. It was a estate built by Newham Council 30 (ish?) years ago especially for local young couples on the waiting list who wanted to stay in the borough and buy its family sized homes. The Council at the time was able to arrange mortgages. The houses are very attractive terrace or semi detached with garages and gardens next to West Ham Park. I don't know if the house prices were subsidised or if the purpose was an early attempt to create mixed tenure communities in the area? Does anyone know? Other pictures in collage show two beautiful chihuahuas puppies whose owner came to the door when I knocked; one of the gates that have sealed off part of Aileen Walk due to ASB, a rather mangy but curious ginger cat that followed us around the road and overgrown tree roots which are causing a pavement tripping hazard that I will be raising a Newham members enquiry about to the Council tomorrow (and various other environmental issues). Hat tip to West Hammer Julianne Marriott for photos.